Home » christmas , christmas songs , comedy , humor , kittens , lee shelton , music » How much do I hate Christmas songs before Thanksgiving? How much do I hate Christmas songs before Thanksgiving? 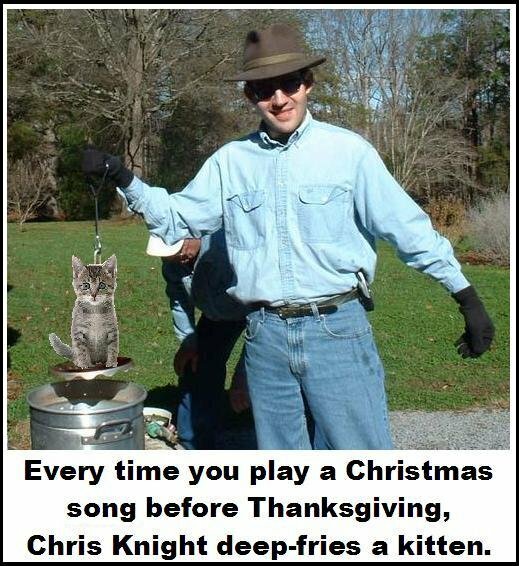 Chris Knight says that it's TOO EARLY for Christmas music!! Can't we wait until Friday?! If I hear ONE MORE #&@% Christmas song I will brutally murder a kitten. In the name of all that's good and holy, THINK OF THE KITTENS!! My good friend Lee Shelton (who is celebrating his first Thanksgiving as a father this year, congrats Lee!) read that, and decided that I was not nearly vehement enough about that sentiment. Acutally here in the US christmas vendors and candy pop up like the day after Halloween in our Grocery Stores. That is one of the funniest things I've heard or seen all week. Lou and I laughed our heads off. I actually have a neighbor who put up outdor Christmas decorations last weekend. To make things worse, those decorations play Christmas music almost constantly in the evening. If my house is quiet, I can hear the Christmas songs across the street and two houses down. I'd hate do be right next door to them. Wear such a t-shirt and you can no longer be my friend. Awww c'mon: you know that I'd never do anything to encourage animal cruelty :-) But you've got to admit: the "Christmas season before it's Christmas season" thing has gotten WAY out of hand. Fercryinoutloud, Costco was putting Christmas stuff out before Labor Day this year! :-\ Believer in capitalism though I am, stuff like this just makes the year go by that much faster than it needs to go.